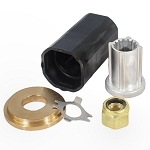 Designed for better acceleration and top end speed. Aggressive cupping keeps the propeller hooked up to the water for fewer blowouts while cornering. 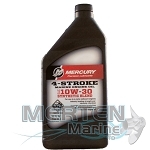 Gets your boat on plane faster and keeps it on plane at slower speeds. The high rake and thin blade design allow for increased efficiency. 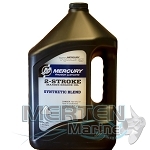 Enertia prop has also been proven to increase the overall performance of runabouts and pontoons. 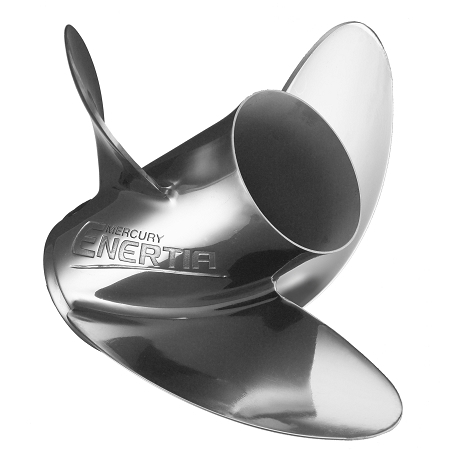 The Enertia is the first propeller to utilize the added strength and durability of the new X7 alloy. This patented new alloy allowed Mercury's Propeller Engineers to develop a propeller design that far surpasses the limits of conventional stainless steel. The X7 alloy is 30% stronger and 4 times more durable than conventional stainless steel. The 11-15P Enertia is the perfect match for 90/115 hp CT and 150+ hp pontoon and tri-toon applications.